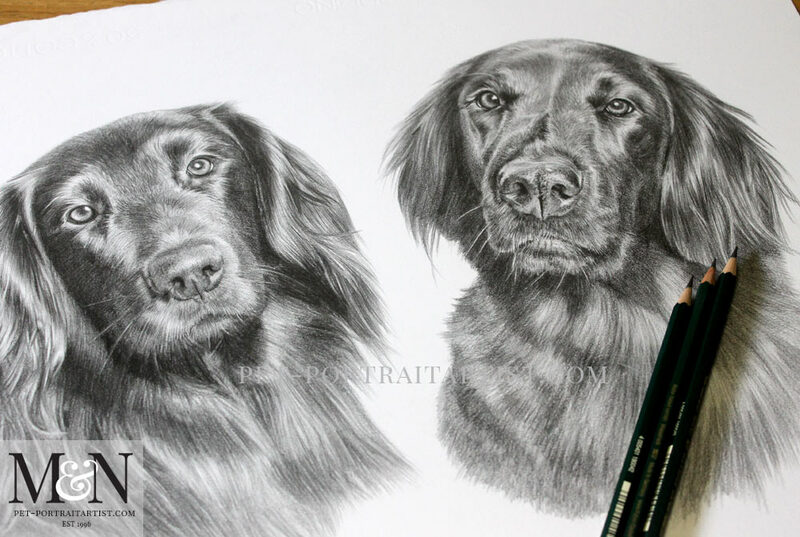 Welcome to my latest Flat Coated Retriever Pencil Portrait. It was traditionally hand drawn by myself Melanie Phillips, using graphite pencil. The size of the drawing was 18 x 14 inches on Italian Fabriano paper. 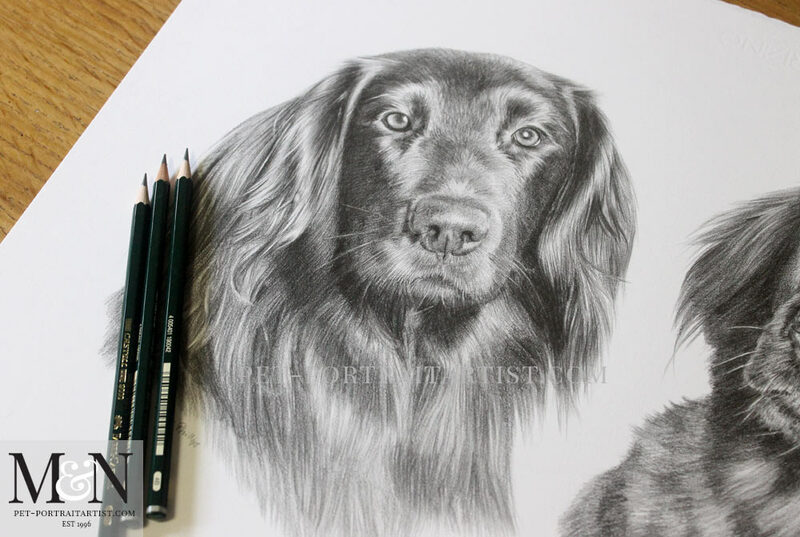 The pencil drawing was completed for clients here in the UK. The drawing will be sent off this week to the owners. Kali and Poppy were an absolute joy to draw. 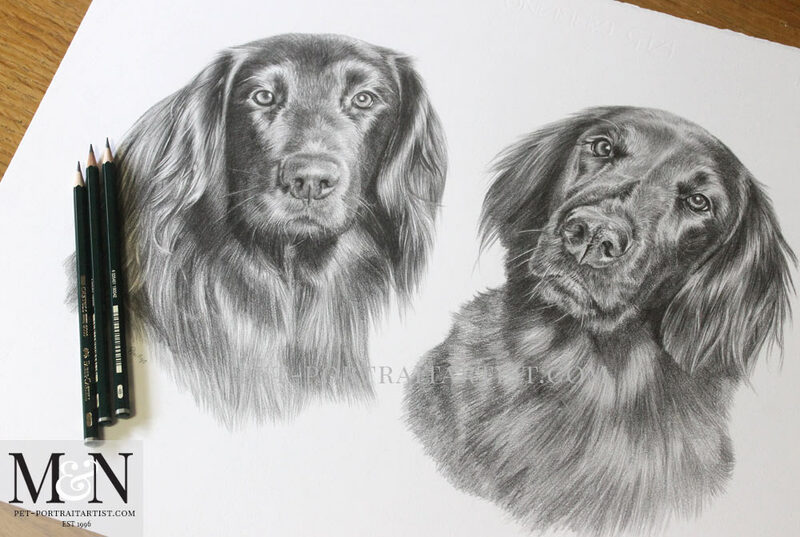 Flat Coated Retrievers are one of my favourite breeds to portray. I have another in my commissions list coming up soon too. We have a friend who has a stunning Flatcoat at our dog training club called Storm. During my time of drawing Kali and Poppy I found myself waiting for my turn at dog training, in a world of my own standing with Storm studying his ears and fur. Luckily Storms owner never minds me gazing at him, as he is simply gorgeous! Alan emailed when he saw the final scan, and when he received the portrait too, which you can read below. They are both absolutely brilliant. Thank you. It’s almost as though I am looking at the real thing. We can’t wait to put them up. Thank you. A belated thank you for the safe arrival of your masterpiece. Apologies. We have been moving around and have only just seen it. You have captured each dog perfectly. We are so grateful. Thank you. 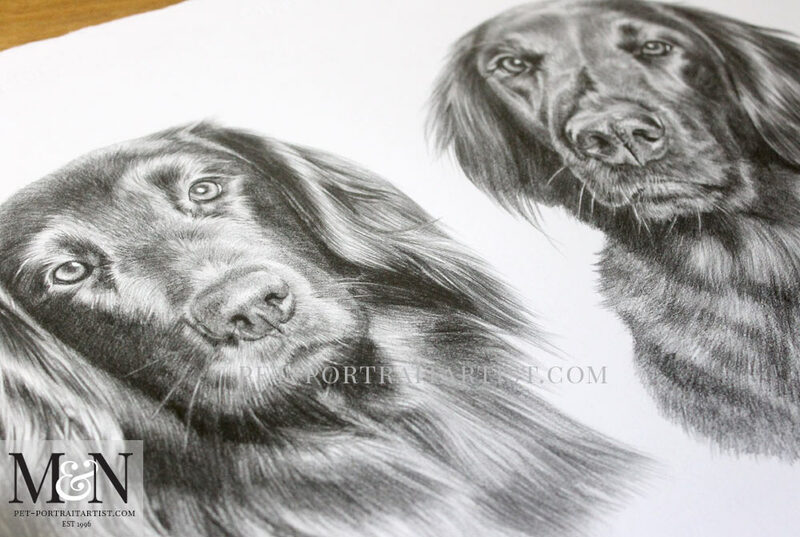 Here are a few photo of the Flat Coated Retriever Pencil Portrait on my plan chest with my pencils to help show scale. I always feel my drawings look much more natural in photos than scans. The scanner seems to crate a harshness to them that just isn’t there in the originals. 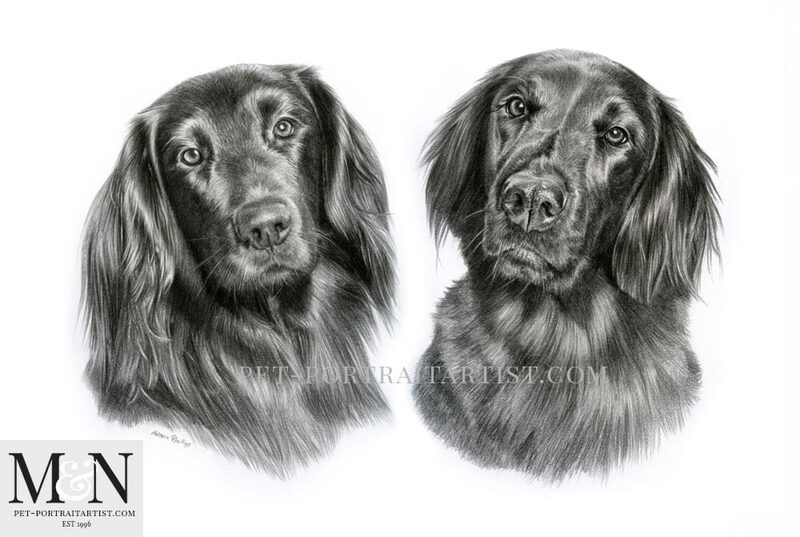 Kali and Poppy were fantastic to draw and I hope you like the photos. Before packing the portrait I took a few photos to show how it is presented. 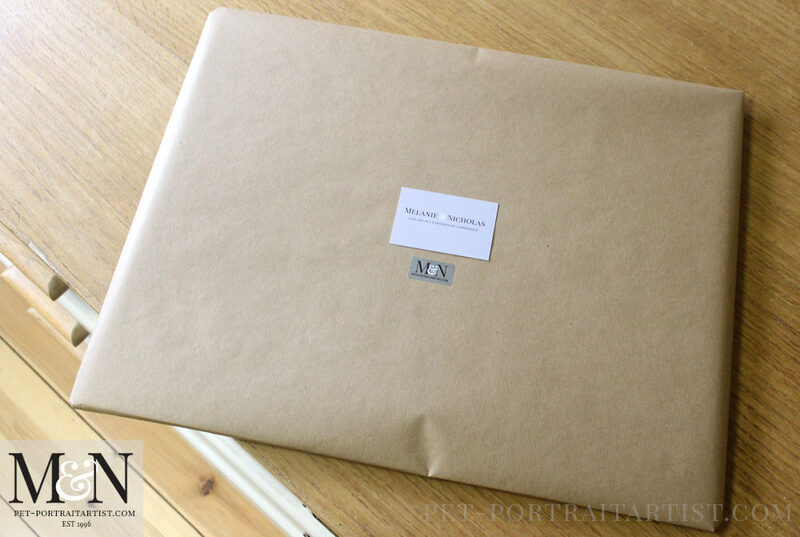 I cover the drawings in cellophane and then wrap them in brown paper. Then I place one of our stickers on the front along with a business card. We have had the cards printed recently and we love them. Double sided with our contact details and logo on the back and our website address and name on the front. They are a silvery pale purple colour to match the silver stickers. Quite shabby chic we thought! We found a printers locally to us who can print all sorts of things. It’s always great to have a new contact. 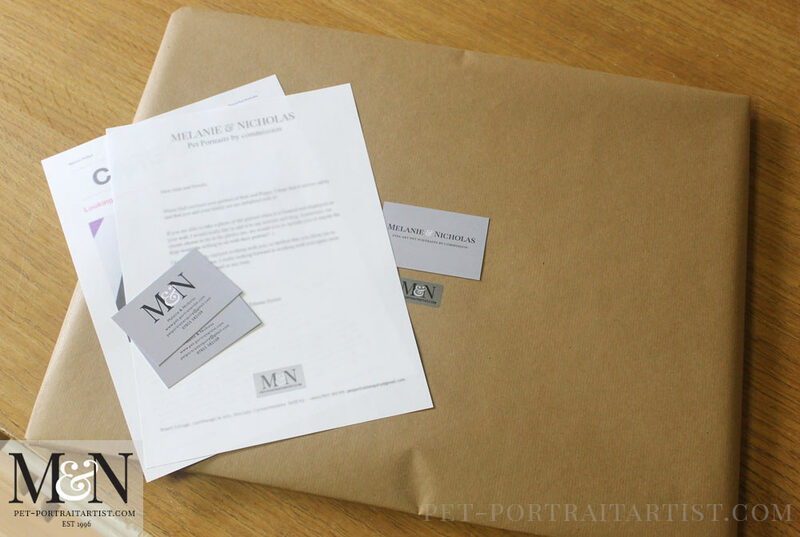 I’m still experimenting with my presentation packaging so watch this space as it develops over the coming weeks and months!